‘What’s happening in Washington State is really exciting for those of us trying to get farms out of the water in B.C. for the last two decades,’ says Aaron Hill of Watershed Watch Salmon Society. Fish farm opponents and proponents alike are waiting with bated breath as a bill to phase out open-net aquaculture farms in Washington State sits on Governor Jay Inslee’s desk for final approval. If Inslee signs the bill, it would mean the end of farmed Atlantic salmon reared in net pens in every jurisdiction on the west coast of North America — except British Columbia. Alaska practises a controversial form of salmon ranching, but the state, along with California and Oregon, does not allow open-net fish farm operations. As pressure mounts on Washington State, where a mere 10 fish farms are in operation, attention has turned to British Columbia where more than 100 fish farms dot the southern and central coasts. B.C. mulls moving fish farms with expired tenures — but where? The B.C. government is currently considering whether or not to renew the tenure of 22 operations, 18 of which are clustered in the Broughton Archipelago, a narrow wild salmon migratory route between the mainland and Vancouver Island where many local First Nations have historically opposed the aquaculture industry. The Washington initiative has heartened opponents of open-net fish farms in B.C. “What’s happening in Washington State is really exciting for those of us trying to get farms out of the water in B.C. for the last two decades,” said Aaron Hill, executive director and ecologist with Watershed Watch Salmon Society. Hill said some B.C. politicians have floated the idea of moving the fish farm tenures to ocean areas outside the Broughton Archipelago, which he said isn’t a true solution. 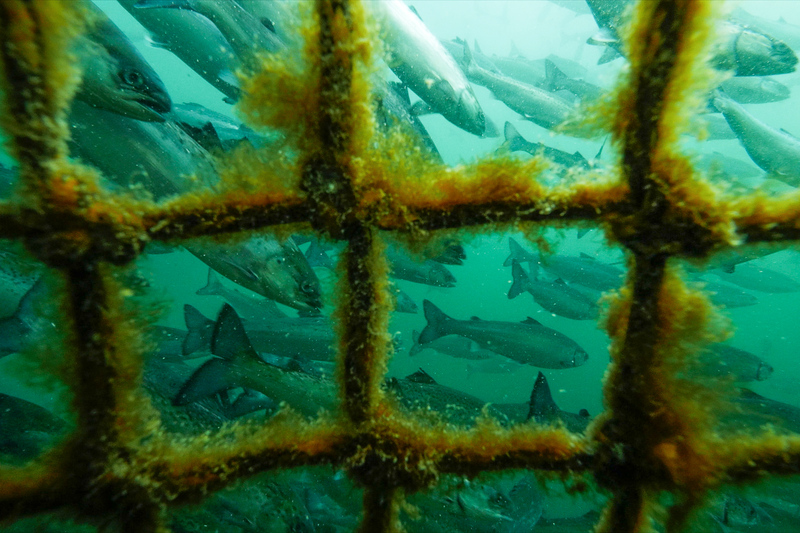 Pressure escalated in Washington State in August after a net at a fish farm owned by the Canadian company Cooke Aquaculture failed, releasing more than 240,000 farmed Atlantic salmon, considered an invasive species, into the Pacific. In February a multi-agency investigation into the incident found Cooke Aquaculture failed to adequately maintain its nets, which were burdened with 100 tonnes of mussels and debris, showing a “reckless disregard” for the state’s waters and people. The report was swiftly followed by proposed legislation to phase out the industry. State Sen. Kevin Ranker, a Democrat, said Washington’s efforts will be less effective if B.C. doesn’t follow suit. “The salmon, the orca whale, the ecosystem doesn’t recognize the international boundary,” Ranker told the Canadian Press. In B.C., where wild salmon stocks have been in a precipitous decline for several years, critics say not enough has been done to monitor stocks and eliminate threats. The 2012 Commission of Inquiry into the Decline of Sockeye Salmon in the Fraser River, headed by Justice Bruce Cohen, cost taxpayers more than $37 million and made 75 recommendations designed to save wild salmon runs after the disastrous 2009 sockeye run. But according to Watershed Watch Salmon Society, very few of those recommendations have been acted on, including the inquiry’s call for removal of fish farms from the Inside Passage if they’re found to represent even a minimal risk to wild salmon. “There’s this huge range of threats to our salmon runs and the viruses and parasites from salmon farms are something we can actually do something about. We can actually remove that threat,” Hill said. Stan Proboszcz, science and campaign advisor with Watershed Watch, said the need to help wild stocks rebound is becoming more urgent. Proboszcz pointed to a 2008 bipartisan provincial report that recommended the aquaculture industry be transitioned to closed containment pens.